Unfortunately we are in a climate of bad news regarding our public schools. Principals are not wanting to talk about this on the record, but the NYC Department of Education put out a chart recently showing teacher cuts per school, should Albany’s $1.5 billion statewide school budget cut get adopted. The chart — which proposes what will happen if the youngest teachers are fired first, as per union rules — shows more bad news for PS 58, the Carroll School, in Carroll Gardens on Smith Street between Union and President. The DOE chart suggests that PS 58 could see 18 percent of its teachers cut, from 57 total teachers to 47. That’s the biggest percentage cut in District 15, which spans a large segment of Brooklyn. The document says that 17 percent of PS 38’s teachers, in Boerum Hill, could be cut, from 36 total to 30 teachers. 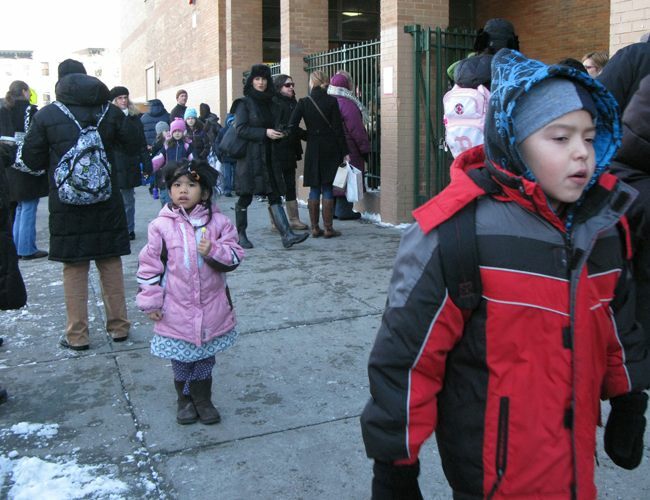 PS 29 could see three teachers cut, or 7 percent of the total. The teachers I’ve talked to say the proposals for teacher cuts right now are simply scare tactics by Mayor Mike Bloomberg, who is locked in a battle with the United Federation of Teachers over the “last hired, first fired” union policy, that makes it difficult to lay off senior teachers. Bloomberg says he wants to change that and make firings “merit based.” The DOE chart of teacher cuts illustrates what can happen if younger teachers across the board are cut. Clearly, there’s a whole lot of politics flying around. Meanwhile, other DOE proposals have suggested slicing the school construction budget in half. With the recent bad news in Park Slope, Carroll Gardens, Cobble Hill and Boerum Hill, that all kindergarten seats are filled and some in-zone kids are wait-listed, this is not the news we want to hear. The state budget will pass April 15. And then it’s late May or early June that principals find out exactly what their budgets are. N.Y. City Council Speaker Christine Quinn suggested at the Carroll Gardens Neighborhood Association meeting on Wednesday that the DOE contracting budget should be examined. “DOE contracting seems to be growing exponentially, without any checks at all,” Quinn said, ironically in the auditorium of PS 58. “The contracting budget is huge,” including professional development and technology. Meanwhile, a preschool teacher at PS 32 with 30 years of experience in the system said she thinks the cuts and talk of teacher firings is a red herring, a smoke screen to cover up spending elsewhere in the education budget. Here’s a small chart culled from the DOE’s larger chart of proposed teacher cuts.